From the moment the Seattle chapter was formed, it was a magnet for media attention. Click the cover to read Seattle Magazine's October, 1968 article about Aaron Dixon and the Panthers (in pdf format). We also have more than 100 newspaper articles from the period. The first BPP office at 1127 34th Ave. Here a are photos of all of the Party headquarters and Breakfast Program centers. Video Oral Histories: Short biographies and streaming video excerpts of interviews with BPP veterans. The Black Panther Party for Self Defense established its Seattle chapter in the spring of 1968. It was one of the first authorized chapters outside of California. The Seattle chapter also lasted longer than most, surviving until 1978. Although the membership was never large, the organization made a major impact on the region. 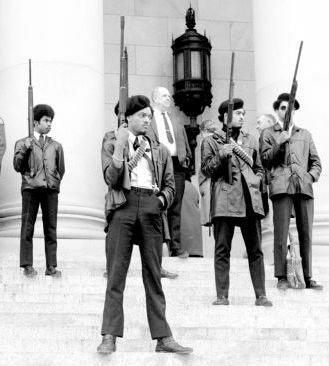 With their black berets and leather jackets and their commitment to armed self defense, the Panthers became role models to some while scaring others. Either way, the organization showed Seattle that its struggles for racial justice had moved beyond persuasion and nonviolent protest. 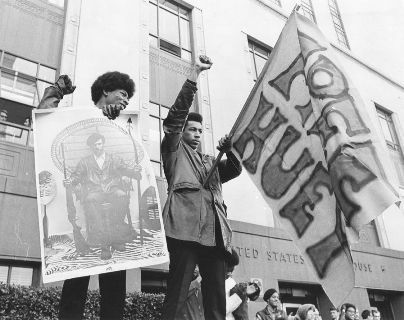 This page introduces the Seattle Black Panther Party – History and Memory Project. The unit comprises the most extensive online collection of materials for any chapter of the Black Panther Party, including the Oakland chapter. The links above and below lead to more than a dozen oral histories, scores of photographs, BPP Bulletins, more than 100 newspaper articles, and the complete transcript and exhibits from the 1970 Congressional Hearings into the activities of the chapter. A slide show and a three-part essay tell the story of the BPP Seattle chapter. Huey Newton and Bobby Seale founded the Black Panther Party in Oakland, California, in late 1966. The rest of the world learned about the organization the following year, after a contingent of heavily armed Panthers marched onto the floor of the California legislature protesting a bill to ban firearms in public places. Weapons and armed self defense were key elements in the Panther program, one part of which focused on protecting black communities from brutal policing practices. 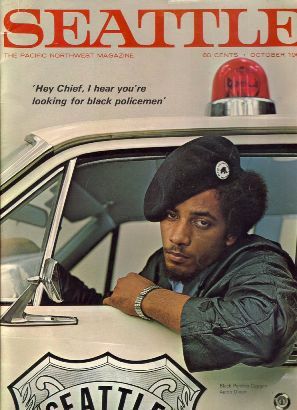 Calling police officers “pigs,” and following them as they patrolled black neighborhoods, the Panthers were soon involved in deadly gun battles with police in Oakland and later in other cities. The uninformed thought of the Panthers as Black Nationalists, but the Party was actually committed to revolutionary internationalism, taking some of its program from the “Little Red Book” (Quotations from Chairman Mao Tse Tung) and identifying with third-world revolutionary movements. The Washington state chapter of the BPP was established in April, 1968 after Aaron Dixon, Elmer Dixon, Anthony Ware, Gary Owens and several other future Panthers attended a memorial service in San Francisco for 17 year-old Bobby Hutton. Hutton had been killed by Oakland police in a shootout in which Party leader Eldridge Cleaver was also wounded. While in Oakland, the Seattle youth met BPP Chairman Bobby Seale, whose subsequent visit to Seattle marked the beginning of the Washington State chapter. The history of the Washington State chapter can be followed in the accompanying pages. Janet Jones is the coordinator of this special section and conducted all of the interviews. Alexander Morrow and Nathan Roberts served as Associate Editors. We wish to thank members of the BPP Legacy Committee for sharing stories, photographs, and documents. Thanks also to the Seattle Times, Seattle Post Intelligencer, Seattle Medium, University of Washington Daily, and Afro American Journal, and Seattle Magazine for the articles and photographs that appear on the News Coverage page. 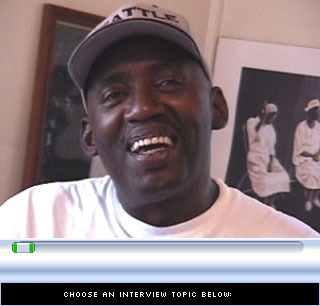 Video Oral Histories: Short biographies and streaming video excerpts of interviews with BPP veterans Aaron Dixon, Elmer Dixon, Michael Dixon, Mark Cook, Jake Fiddler, Leon Hobbs, Ron Johnson, Michael Murray, Garry Owens, Mike Tagawa, Bobby White, Shamseddin Williams, Kenyatto Amen-Allah. Plus related interviews with Larry Gossett and Wes Uhlman. Photographs: From the Washington State Archives; Eugene Tagawa collection; Aaron Dixon collection; Fred Lonidier collection, and the Musuem of History and Industry. News Coverage: We have digitized more than 100 newspaper articles that appeared between 1968 and 1979, making it possible to follow the news coverage that surrounded the BPP. Congressional Hearings: In 1970, Congress launched a full-scale investigation of the Black Panther Party. One set of hearings focused on the Seattle chapter. Here you can read the testimony and view the exhibits collected by Congressional investigators. Included are photographs of members and buildings that served as Party offices or breakfast program centers, and testimony from police officers and a secret undercover witness. Chapter History: This three part essay by Kurt Schaefer explores the first three years of the Seattle chapter of the Black Panther Party from its founding by Black Student Union members in 1968 through the 1970 crisis negotiated by Mayor Wes Uhlman. Map: Locations of offices, breakfast programs, and key events, with google street views of the sites today. Offices: 1970 photos of offices, breakfast program locations. Mugshots: Police booking photographs of suspected Panthers. Documents: The five issues of the Seattle Party Bulletin. Links: Online links to information about the Seattle chapter, other chapters, and the Black Panther Party headquarters. For Teachers: a lesson plan and materials suitable for high school classes.